Rocking a band t-shirt when you don't actually listen to the music you're repping? Risky move, my friend. 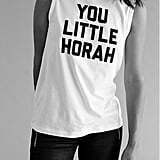 But these Unkosher Market tees, created by LA-based duo Alice and Shiran, are not at all like that. Sure, they've all got phrases those who practice Judaism would pick up on, but you don't have to be religious to think they're funny. Anyone who's up to date on pop culture would immediately recognize "Shvitz It Out" as a play on Taylor's Swift's "Shake It Off." 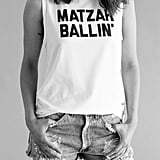 And making a statement like "Matzah Ballin'" is just plain hilarious. "Kiss My Tuchis" might be the label's most popular style, with "Tuchis" as a substitute for booty, but really, we're giddy over all these designs, which would make for perfectly playful gifts this holiday season. 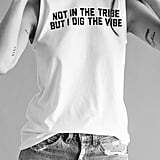 Read on to shop (and laugh over) the whole collection of casual tops that retail at $48, to be worn with cutoffs, leggings, or your booty shorts before bed. Oy vey, we just might have to buy them all.